The best images I’ve been able to find are below, first prep/kitchen scenes, followed by dining scenes. (B) / (C) – Kitchen scenes from Luttrell Psalter; English, around 1320 – 1340. (D) – Butchering Pigs; Late 15th century woodcut, 1490. The most notable difference in this small selection of drawings, is the shape of the blades; Those in the prep scenes are typically broad and rectangular, while knives at the dining table are more…. “knife shaped…?” This trend also exists in other drawings not shown. Of the knives described as “mid” and “late” 14th century in the Museum of London “Knives and Scabbards” book, the larger blades also tend to be more rectangular in profile, in contrast with the triangular and leaf shapes of the smaller ones. MOL also gives blades matching the profiles of those in (B) and (C). So it does look like the rectangle knives are fairly common, with all the big knives in the below pictures looking like mini machetes. Jan 27, 2013: Lit the forge today. The blade is quite a bit shorter than planned because the steel cracked and had to be cut back. Still managed to salvage something serviceable though. The ones below are scale replicas of three of the “Late 14th C” finds documented in the “Museum of London; Knives and Scabbards” book. From the top down, the originals are items 70, 72 and 76 in the MOL book. 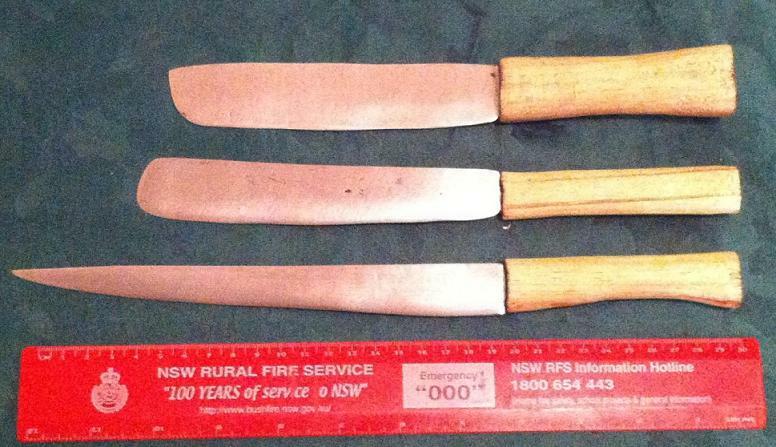 The original shapes of corroded blades were estimated by photo-copying the originals to full size, gluing the cut-out paper version to some manila and “filling out” a sensible blade profile. The resulting paper/manila template was then used as a guide while forging. Dying with Indigo - success!